Originally developed by Wilson Fletcher Studios as a multi-timer application focused on cooking back in 2014, I got tasked to design Diiing v2, take it to the next level and optimize it for the iPhone and more importantly the Apple Watch. Diiing was originally developed by Wilson Fletcher Studios as a multi-timer application focused on cooking back in 2014. The inspiration came from members of the team struggling to time all the elements of a roast so that they were all ready at the same time - and this quickly became the scenario that we worked around. We explored many different concepts at the time but settled on a gantt chart style display as its seemed the best way to show relative timers alongside each other. During my time at WF, I got tasked to design Diiing v2, take it to the next level and optimise it for the iPhone and more importantly the Apple Watch. The main purpose of this exercise is design and build WF’s first Apple Watch application which will prove extremely useful in new business meetings and demonstrate skills in adapting to emerging technologies. 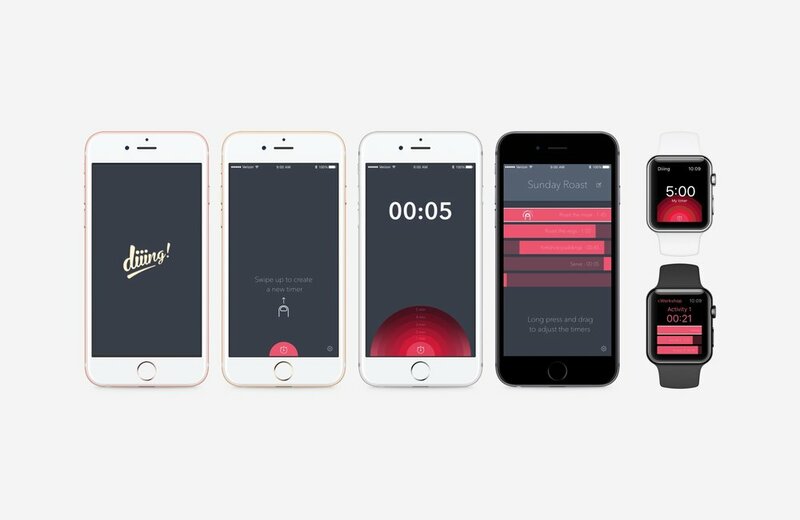 Diiing app would enable users to keep track of time via their iPhone or Apple Watch. How to effectively keep track of time for a series of activities/tasks running at the same time on the go. Timer set - finished: as a user I want a notification (visually/audibly) that all timers have finished. I conducted a quick competitive analysis to understand what was available on the Appstore that had similar interactions and functionalities. Having an iphone / apple watch app would extend the range of scenarios where the app could be used. I identified a few more relevant activities where Diiing could be used. Through research, 4 different timing scenarios have been identified. The user interaction should be flexible and adjusted to the pertinent scenario. Gantt chart style display seemed to be the best way to show relative timers alongside each other. After the research phase, I focused on defining the core functionalities based on the different user stories requirements. at this point I started fleshing out the in app-interactions. This concept is a concentrate of the 3 previous concepts, after a presentation and brainstorm, I tried to gather all the learnings to include the highlights and interesting ideas from the other concepts. I wanted to keep it simple, beautiful and easy to use. Designing for a brand new device (Apple Watch back in 2015) was an interesting and challenging project. The most difficult part was to design for a device I didn't have at hand and had to rely on the Apple Human interface guidelines to properly understand the usage and behaviours. It was a fun side project to work on, being able to test quickly with colleagues getting quick feedback and iterate on designs.